Many advertisers, and all of our best customers, recognize the value and effectiveness of direct mail in their marketing campaigns. As we reported recently on this blog, surveys have shown that a majority of consumers, including Millennials, go to the mailbox each day with anticipation. For the most valued brands, direct mail brings a convincing and trusted message to people of all ages. Most marketers today also use social media advertising as part of their media mix. Marketing on social platforms provides a level of consumer-specific targeting and post campaign analytics that are unique. Recently, however, there has been a marked slowdown in the growth of social media user adoption, especially on Facebook. On the one hand, young people are moving to alternate platforms such as SnapChat. On the other hand, Facebook has a credibility gap brought on by questionable news and information sources and manipulation of user newsfeeds by platform algorithms. Fortunately, marketers can merge the best of both channels, i.e. the targeting capabilities of social media and the authoritative messaging of direct mail. By integrating these processes, marketing content will become more precise and sales conversions rates will increase. For several years now, Facebook has been offering business users the ability to upload customer mailing lists into their accounts. Facebook compares this customer data against all their users to create an ideal target profile. Then similar users can be found and marketed to through Facebook Ads. Marketers can reach far more people and, at the same time, test various advertising messages and imagery to see what is getting the best response from target Facebook communities and users. Capturing analytics on test campaigns provides deeper insight into customer attributes and behavior such as education level, hobbies, interests, purchasing habits and more. This degree of demographic granularity is not possible with traditional direct mail data. It is also very hard to acquire it through landing page surveys and other online mechanisms. 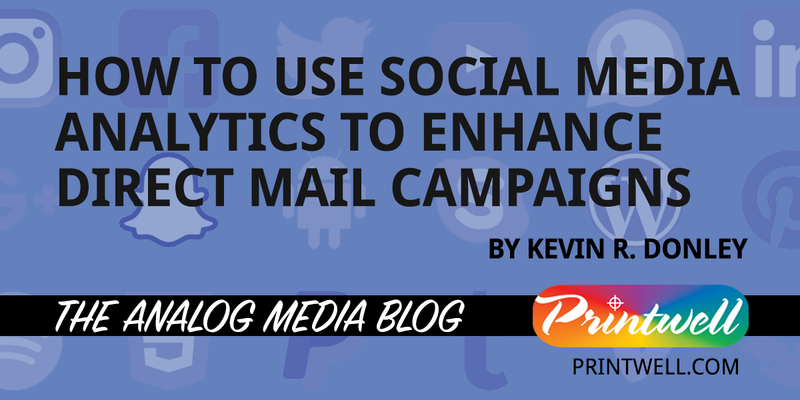 Once captured, the analytics can be used to more precisely target subsequent direct mail campaigns, bringing the integration with social media around full-circle. With these techniques, marketers do not have to choose between targeted digital and scatter-shot print media marketing; they can manage campaigns that take advantage of the strengths of both. At Printwell, we are committed to providing information to our customers and partners that helps them to stay up-to-date on the latest methods and technologies in the direct mail and publishing markets. Contact your account representative for a consultation or send us a message here and someone from our sales team will get in touch with you.